Tirupati, 23 Mar. 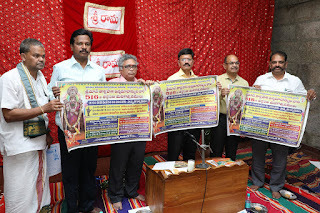 19: TTD Joint Executive Officer Sri B Lakshmi Kantham released wall posters of the 516thAnniversary Celebrations of Saint Poet Tallapaka Annamacharya at the Sri Kodandarama Swamy Temple on Saturday morning. The JEO said that April 1-4 the bhajans and Bhakti sangeet programs will be conducted at the Dhyana mandir, Near the 108 feet Annamacharya statue at Tallapaka, Mahati auditorium and Annamacharya kala mandir at Tirupati.Prominent singers, dancers and Harika that's bhagavathars will participate .TTD also plans to conduct a 3 day literary convention at the Annamacharya kala mandir from April 1st.